We are now well into the season of fêtes and festivals. First we went to the Raspberry Festival in a nearby village – where we had a slice from the largest raspberry tart in the world ( Guinness Book of Records apparently). We then had the Peach Festival in our village – frankly not very exciting and not a record in site. However there was a very enjoyable meal in the village square on the Saturday evening – everyone sat around together in a large open sided marquee. We sat with some neighbours, and thoroughly enjoyed it. The menu was somewhat peach biased – ham, melon and peach, followed by duck, baked potatoes with caramelised peaches, soft cheese with peach coulis, a peach sorbet and to finish....a peach. Wine and coffee included for about £12. The evening finished with a really excellent firework display. 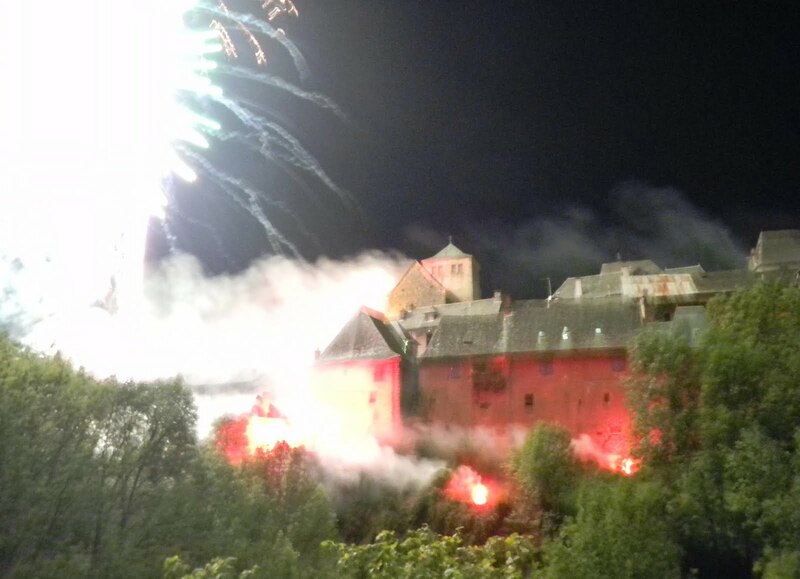 We knew about this and had been told that it would be set off on the ramparts. Well, there is a street just above us called “Rue de Remparts” so we thought that was the place, at least until we looked out of our window and saw some fireworks being set up in our garden. We crossed the little valley behind our house with a couple of hundred others and had an excellent view of a very well organised show. Inspired by the peach theme, and with a recently purchased box of the things to use up we have been trying our hand at making and bottling some chutnies. Judy's peach and chili is superb, my peach and tomato is ...interesting. As a member of the Franco British Chamber of Commerce we were invited on a visit to the new airport at Brive. It is a fairly basic operation, with only return flights to Paris most days, an the City Jet to London on Friday, Saturday and Sunday. This seems to be going well as City Jet have extended their timetable into October. 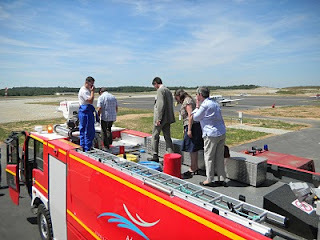 We were shown around the control tower, and the airport firemen were very happy to show off their fire engines, and give us a short ride. As always the visit ended with a very nice buffet lunch. One of Judy's friends from her last job, Heather Wilson, is restoring two properties near us, and she dropped in for a night on her way back to UK. We found we had other friends in common around Faringdon as well. A few days later two of her friends, Nick and Andy, dropped in on their way back. They are doing some work on Heather's house, and are from Carterton - so were able to catch up on a few things! Life gets a bit more hectic over the next few days. Tomorrow two friends from UK are coming to stay for a few days – Jim and Angela Wiggle. On Friday we are flying back to UK for a family party on the Sunday – Judy's sister's 25th wedding anniversary – in Stoke. Saturday we are back in Filkins for lunch to see if they are missing us (or noticed we had gone). We are then staying with friends, Rennie and Peter Thompson, for the night. Back on the Monday, a few days to recover our breath, and then two more old friends to stay – Dave & Juliette Makepeace.. Really looking forward to it!